Across Articles, Events, Email, Social Media and More. Reach a monthly digital audience in excess of 70,000, and a total audience reach of over 250,000 each year. The only nanotechnology news platform where you can reach your audience across desktop, tablet, social, mobile, apps and Apple News. We boast a fully engaged audience, which includes companies, investors, academic institutions, scientists, students, and people interested in nanotechnology. We offer a comprehensive set of media and marketing services, from specific packages for articles and events to bespoke marketing solutions tailored to your need, for more information please download our media pack. 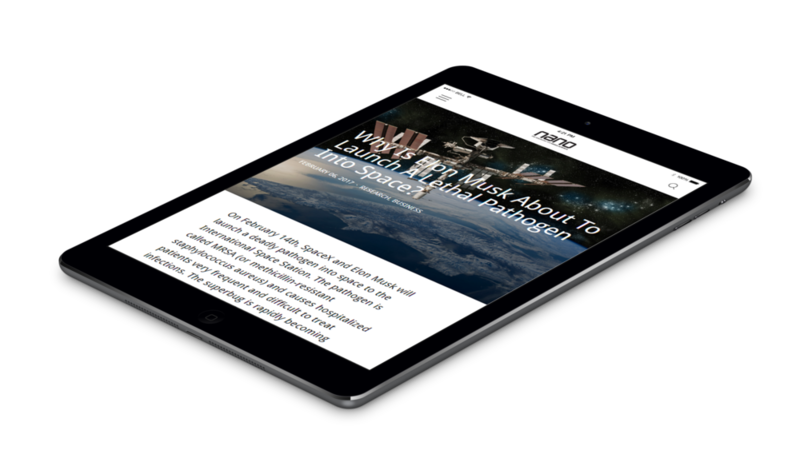 The Nano Magazine publishes daily online articles for the nanotechnology field, with featured news for research, business and funding. Weekly opinion pieces are published, written by guest contributors. Our events section is updated on a regular basis to include a broad range of listings that include seminars, meetings and workshops together with the major conferences, exhibitions and trade shows across the world. Our team can provide bespoke solutions to reach an educated and informed readership across our multiple channels, incorporating sponsored editorial, social media, dedicated microsites and competitions. Our team can help produce creative solutions to create strong, positive involvement from Nano Magazine readers and deliver a big impact for your brands.